Well, a week for curing is finally up! These are my first projects from the Charcuterie cookbook. Started by firing the faithful WSM up, preparing for a steady day of smoking. First up is the Pastrami (a trimmed 13lb packer cut brisket), which I plan on smoking with hickory till it hits 150 degrees, then braising in water for 3 or so hours to help make it tender. After the Pastrami comes off the smoker, I plan on throwing the bacon (2 bellies totaling about 12 lbs I believe) on, using apple wood for smoke. Should be a good day of cooking, though my hand already dreads all the slicing that lies ahead. Ohhh... man! I'm still full this morning! Seriously, that was probably the best pastrami I have ever eaten and I grew up an hour and a half away from NYC. Need to do 2 or 3 briskets next time as a full (flat and point) 13lb brisket yealds only about 5 lbs off lucious, jucy, tender pastrami. I thought the point would be too fatty (even for me) as it can be when cooking BBQ but it was perfect. Half flat and half point makes the ideal "jucy" sandwitch. The bacon was good, but not as good. The key issue being the quality of the bellies. One turned out quite nicely, but the other was mostly fat. Jamie now has 5 lbs of "bacon" for beans, soups, etc. adn about 5 lbs of good breakfast bacon. Nice work. Pastrami has been on my to-do list for quite some time. Your success has produced some serious jealousy that's going to drive it higher on my list. Really nice looking bacon (pastrami too), Jamieson, and I know you will get many happy Sunday morning breakfasts out of it. If we don't manage to turn up a better source for pork bellies, I'm kind of leaning toward buying the rib bellies and trimming them myself in the future for maximum belly. I got a nice looking belly that way, cut the ribs so lean they hardly seemed worth saving but the belly looks quite good. But I hope to find better, somewhere. Has anyone had any luck with Paulina or any other butchers? As far as I remember Paulina sells a nice thick bacon, so you have to figure you could at least order one raw. I did see that you can order Niman bellies, though $4.60/lb before shipping is more than I'd like to pay. Beautiful thread Jamie. Homemade pastrami is an outstanding meat. I've made several from scratch myself over the years. Always with great success. Bill/SFNM has a great recipe I've used. Although, Bill has said he now buys corned beef points for pastrami now. Can you give a few details about the brisket you started with? Where? Grade? Last edited by Bruce on October 29th, 2006, 1:29 pm, edited 1 time in total. Bruce wrote: Can you give a few details about the brisket you started with? Where? Grade? It was a 13 pound packer from Excel Corned Beef (Lake St, near Peoria Packing). Honestly I am not 100% sure of the grade, so maybe someone else can chime in that may know. They sell them for about $1.50/lb or so, and it comes in cryo. This is pretty much the only (cheap, reliable) source I know of around here for packers, and where I get all my briskets. I probably trimmed about 1.5-2 pounds of fat off it, trying to leave a thin layer of fat cap as I wanted to be able to just slice and eat. Once done I separated the flat and point and cut each against the grain. Jamieson22 wrote: It was a 13 pound packer from Excel Corned Beef (Lake St, near Peoria Packing). Honestly I am not 100% sure of the grade, so maybe someone else can chime in that may know. Excel uses Choice grade beef. After 7 Italian Beef Joints yesterday, at the Beef A Thon finals, I didn't think I'd be hungry for beef for weeks. One look at your delicious looking pastrami pics changed that in a hurry. I think everyone that has a smoker (and I think everyone should) should put this pastrami recipe on their short list. Honestly, the hardest part was moving the refridgerator shelves around to make room for it. I buy 90% of my briskets from Excel also. 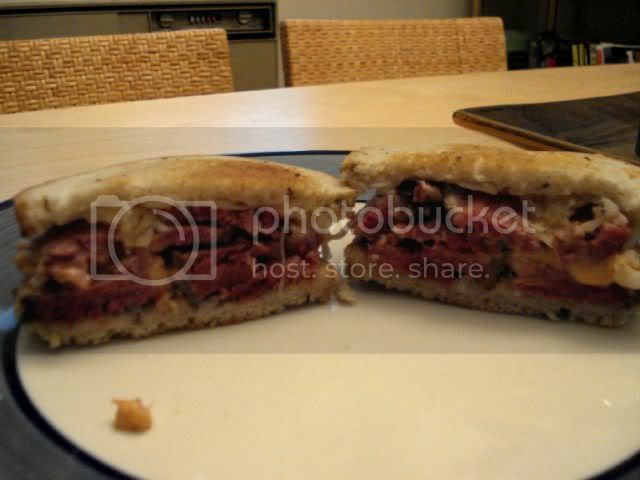 I have also used their corned beef to make pastrami. Bill's a great guy. Excel always uses choice and occasionally I think a prime grade gets snuck in their once in awhile. I usually pick up a case of briskets at a time. I'm lucky regarding refrigerator space. I have three kitchen refrigerators and two dorm style here at home. Something to think about. Now that the weather is cooling off you can brine out on your balcony fairly easy in an ice chest or even a plastic bucket with a couple of ziplocs full of ice. Bruce wrote: Something to think about. Now that the weather is cooling off you can brine out on your balcony fairly easy in an ice chest or even a plastic bucket with a couple of ziplocs full of ice. Yeah, I had been considering that. Any guidelines? I am guessing as long as the cooler is clean, it can be used without any sort of lining? And do I just replace ziplocs of ice as needed? Next time I do pastrami, I would prefer to do quite a bit more and no way can that fly in the fridge. Now, one thing I am still working on understanding is the brine solution. My recipe called for 5lbs brisket, so since I had 13lb I usd 2.5 x the recipe. If I had 2 packers at 30lbs total, would I really need to use 6x the recipe for the brine or is the concentration of it more important than the volume (does that make sense)? Jamieson22 wrote: would I really need to use 6x the recipe for the brine or is the concentration of it more important than the volume (does that make sense)? The concentration (and time) is all that really matters as long as the meat is completely submerged in the cure. Bill/SFNM wrote: The concentration (and time) is all that really matters as long as the meat is completely submerged in the cure. Okay, so the brine I used for my 13lb brisket could have cured 2 briskets as long as there was enough brine to cover both of them? I tend to cure for ~3 days depending on the size of brisket, but unlike the Ruhlman recipe, I pump cure into the meat as well as submerge it. If you're going to be curing outside, shoot for curing temp around 38F. Even though you're using curing salts, you don't want to be in the danger zone for food borne illnesses. On the other hand, curing is said to be inhibited at temps below 35F. I have a small wine cooler that I picked up at a garage sale that I use for charcuterie, cheeses, etc. Splendid photos. Looks so delicious! Jamieson22 wrote: I think everyone that has a smoker (and I think everyone should) should put this pastrami recipe on their short list. Super inspiring post! I'm learning my way around a WSM and can't wait to give this a shot. I have a not very big fridge, but the porch and weather can compensate. Thanks for sharing the pics of process! I just figure it's going to be so expensive at their retail prices as to defeat part of the point of making it myself. Might as well buy their (excellent) house-made bacon. As discussed recently, these guys sell Berkshire bellies at about $3/lb., which is getting more reasonable and something I'm going to try one of these days, though still more than double an industrial one from Peoria. The equivalent from Niman is about $5.50/lb. Does anyone have a really big freezer? Saw this post on the Virtual Weber Bullet. Take a look at that berkshire BACON! I love the Ruhlman/Polcyn book -- and have made at least a couple dozen recipes from it -- but the pastrami has been my absolute favorite one so far. It's outstanding as is and requires no significant tweaks. The techniques and methods detailed in the book are consistently excellent but I find that most of the recipes, especially those for sausage, don't end up exactly meeting my expectations. That's not to say they're not delicious -- they are -- but they don't often match up with my expectations for what the finished products should taste like. Great work, Jamie. Those pictures never get less mouth-watering! Ronnie-- in what way do you find them to be off? I've only made sausage once so far-- the wine and garlic one-- and the result was overpoweringly winey and garlicky, no one but me could really stand to eat it. (Though maybe if it had a couple of months in the freezer to mellow, it would be better.) Anyway, yeah, that recipe didn't exactly work for me, I'm curious about some of the others. Mike G wrote: Ronnie-- in what way do you find them to be off? I've only made sausage once so far-- the wine and garlic one-- and the result was overpoweringly winey and garlicky, no one but me could really stand to eat it. (Though maybe if it had a couple of months in the freezer to mellow, it would be better.) Anyway, yeah, that recipe didn't exactly work for me, I'm curious about some of the others. Breakfast sausage -- very good but the fresh ginger made the final product taste more like potsticker filling than what I typically expect from breakfast sausage, which is mostly sage and pepper notes. Andouille -- was not close to what I expected. IIRC, there were several ingredients which didn't work well toward the final product I generally recognize as andouille. I ended up pretty much nailing andouille by modifying a John Folse recipe I found on the net somewhere. Peperone -- very delicious but far more floral than what I was expecting. I felt that the paprika in the recipe led it slightly astray. Italian Sausage (hot and sweet) -- I thoroughly enjoyed both results but again, these sausages tasted nothing like what I am typically used to enjoying here in Chicago. Here too, iirc, paprika (which I do love) was included but just didn't seem to fit. There are probably a few more examples of recipes which needed adjustments to fit in with my expectations but these are a few I remember off the top of my head. Again, recipes are fairly personal, so I'm not knocking the book (it's one of my favorite cookbooks of all-time) just pointing out that even with all the great info provided, there is still plenty of room for experimentation and personalization. If it weren't for the excellent manner in which this book is laid out and written, I'm not sure I would have ever pursued charcuterie as voraciously as I have. Before this book, I dabbled. Now, I am obsessed. Well my allotment is now gone but I have to say it was a lovely ride! I will assume the reason why they suggest air drying is similar to Cook's Illustrated's reasons for air drying brined turkeys before roasting: crisper skin after cooking. I tried Jamieson22's pastrami at Burt's last week. I had somehow missed reading this thread the first time around, so I didn't realize you had gone all out to cure the meat yourself. I have had pastrami made from corned beef soaked several days to desalt, then cover with spices and smoked. Your smoking and braising method was a revelation. The photo of your refrigerator: the bacon was in the plastic ziploc bags and the brisket brined in the large plastic container in the rear. Right? Thanks for documenting your efforts. Bill/SFNM wrote: On the other hand, curing is said to be inhibited at temps below 35F. I have a small wine cooler that I picked up at a garage sale that I use for charcuterie, cheeses, etc. Until now I had never desired a wine cooler, but I have finally seen the light! Is this where you are curing your confit? Do you mind sometime an expanded explanation of how you are using your wine cooler? Tips? Cathy, I have 2 wine coolers. One is a small waist-high Sunbeam that I picked up at a garage sale that I've used variously for brining birds, curing charcuteirie, aging cheese, or as overflow for the main refrigerator when entertaining. I also have a larger one that I use for wine. It has two independently controlled sections - presumably one for whites and one for reds. I used one of these compartments for curing the confit, although I used the last batch so quickly it didn't do much curing. Time to do another batch, I have my order in for more ducks! . I also plan to do a batch of Morteau sausages soon. I'll take pictures and post. I plan to prepare the confit sous vide. One of the important factors for dry curing charcuterie and aging cheeses is the humidity. The climate here is very, very dry (sometimes in the single digits! ), so sometimes I have to add moisture to the air in the cooler. It turns out that a tray of water on the bottom of the cooler does a pretty good job, but it is far from precise. So in summary, I have three separate zones that I can use for these kinds of tasks - the wine has the lowest priority , but I really don't have very many bottles, so they sometimes get shuffled around to make room for the food. Probably not the best thing for the wine, but I can always go to the store and get a bottle. Cathy2 wrote: I tried Jamieson22's pastrami at Burt's last week. I had somehow missed reading this thread the first time around, so I didn't realize you had gone all out to cure the meat yourself. I have had pastrami made from corned beef soaked several days to desalt, then cover with spices and smoked. Your smoking and braising method was a revelation. Not to mention that House of Tsang sauce you have had through 2 apartments and a condo. I made the pastrami you so graciously chronicled! OMG!!!!! What a fabulous piece of meat it turned into. I have been trying unsuccessfully to make my own at home and this was better than any I have ever eaten anywhere! Thanks for the beautiful pix for inspiration!!! jleblanc05 wrote: I made the pastrami you so graciously chronicled! OMG!!!!! What a fabulous piece of meat it turned into. I have been trying unsuccessfully to make my own at home and this was better than any I have ever eaten anywhere! Thanks for the beautiful pix for inspiration!!! I presume the injecting should occur before you begin the curing process? Erik made some reference to you and a deli, did you open your own enterprise?